In this new book, best-selling health writer Larry Trivieri, Jr. has created a clear and simple guide to understanding the science behind turmeric’s effects and how it can best be used to enhance well-being. Part One provides both the history and science of turmeric’s therapeutic powers, including the latest breakthrough research related to turmeric’s most active constituent, curcumin. Part Two offers an A-to-Z guide covering the ailments for which turmeric can provide effective treatment. Each entry presents a description of the problem, how turmeric works to combat the condition, and important considerations during use. This is followed by recommendations regarding the most appropriate form of curcumin and proper dosage. Also included is a resource section that guides you to the best turmeric and curcumin products. 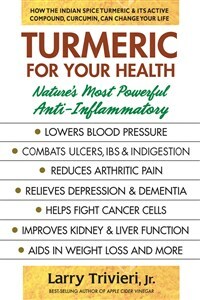 Instead of taking a painkiller that acts only on the symptoms or a drug that can cause unwanted side effects, turmeric acts to alleviate the root cause of a range of medical issues. With few if any side effects, non-addictive turmeric can provide an inexpensive and safe way to enhance your health and improve your everyday life.